I realized this week that I don’t own a full suit. I have way too many blazers, and way too many pairs of pants, but they are not complete suits. And I am OK with that. I think there is something fresh about separates that can be pieced together to create a pulled together suited look. 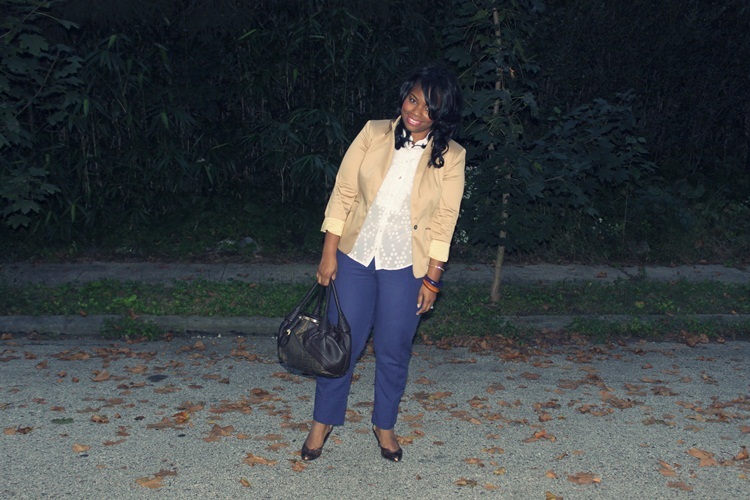 These ink blue trousers were unexpected when choosing a pair to go with this camel blazer, but I love the contrast. And I have always loved a great khaki and navy combination. How will you be wearing the menswear trend this season? Go Lexy!!! I like the idea of non-traditional suits. I found me two cute bow ties and those will be my keys to adding some menswear looks to my Fall wardrobe. I'm looking forward to it. Lexy those heels are so adorable and you hit this trend spot on. I just love the color of your blazer so modern and chic! You look gorgeous, and check this out.. I'm wearing a blazer today because of you! Yes!!! Love that sheer top underneath and how the outfit pulls together and looks so FAB! Love the fit...Lol!!! Lexy you have inspired me so much with the blazers. I have gotten 3 blazers in the last 2 weeks. But I did Thrift one for $4.99. You are so right about finding great blazers at the thrift store, however, with my size being a XS-S, it's hard to find those that will fit. Thanks again for your inspiration!! Amei... E amo todos os seu look Flor! Even though it's not a traditional,suit the look is pulled together and very cute I think I'm leaning towards this kind of look. As usual you look fab!!! I love your post. You are so beautiful to me. thanks TeRea!! :) YAY! So glad you are finding great blazers in the thfit store! I will never shop anywhere else for blazers! LOL! thanks Rebecca! I'm sure you look HOT in your blazer! hehehe! THANKS! I would love to play around with a bow-tied look. Can't wait to see how you rock them! LOL! Glad I could help. LOVE houndstooth! aww thanks Kam! :) and you are gorgeous!